The thick carpet of black soil covering the arena floor has been removed, the riding, roping rodeo folk have all packed up their saddles and moved on; many to the next rodeo town. The 2015 edition of Leduc's long-running and much-loved Black Gold Rodeo has come to another successful conclusion. Although the rodeo also includes a fun-filled midway, an immensely popular trade show, the Rodeo of Smiles and countless more attractions, the entire point of the weekend was to see who would be the winners in the nine events held over the weekend. Now is the time to celebrate the victors, and here they are. North Dakota native, Dusty Hausauer was the winner of this event with a score of 86.5, aboard "Charlie Horse". This was a big win for Hausauer who has been struggling for years to get back in the big money after a serious back injury almost ended his rodeo career in 2008. Last year was a good year for Dusty, having won his event in four 2014 rodeos, including Rocky Mountain House, Brooks, La Crete and Bremerton, Washington. Tied for second place with 83 points each were Tyler Corrington of Hastings, Minnesota and Albertan, Zeke Thurston of Big Valley. This event, for those riders who feel a saddle is just unnecessary equipment, was won this year by Clint Laye of tiny Cadogan, Ab. (population 500). This has been a great year for Laye, who already had three rodeo wins to his credit before gaining the BGR crown, including events in Austin, Texas, Casper, Wyoming, and Red Bluff, California. Clint had a score of 85 while riding Northcott Stable's Bahama Mama. Close behind Laye with scores of 83.5 and 83 respectively were Kevin Langevin of Rich Lake, Ab, and Caleb Bennett of Ogden, Utah. Bull riding is an extremely exciting, popular event at the BGR which features cowboys who are, apparently, allergic to horses, and ride ornery bulls instead. In 2015, the winner of this BGR competition was Dustin Bowen of Hershey, Pennsylvania with 85 points, who was atop Hi Roller. Bowen has already tasted success this year prior to the BGR when he was co-champion of the Wrangler Champions Challenge in Rapid City, South Dakota. Bowen edged out the second place finisher, High River native, Brock Radford who was just .5 behind, while area favourite, Jesse Torkelson of Warburg was only .5 back of Radford with a score of 84. 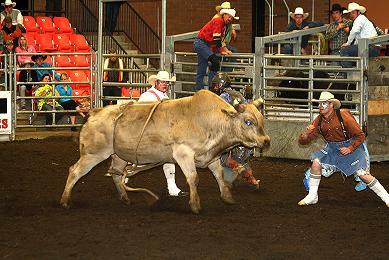 This BGR event, which curiously does not feature the use of tie down straps was taken by long-time rodeo favourite and past Wrangler National Finals Rodeo champion, Shane Hanchey of Sulphur, Louisiana.Hanchey has been a member of the PRCA for six years and has already earned close to $850,000 in that span. Hanchey's winning time was 7.7 seconds. Just back of Hanchey by a blink was Justin Brinkerhoff of Corinne, Utah with a time of 8 seconds and Riley Warren of Stettler at 8.1. For those who think arm wrestling is just not tough enough on the body, is the sport of steer wrestling. This year's victor in this hair-raising event was Didsbury cowboy, Ryley Gibb with a super-quick time of 3.4. There was a surprising three-way tie for second with a time just 1/10th of a second behind were Scott Guenthner of Consort, Cody Cassidy of Bashaw and Clayton Moore of Pouce Coupe, BC. The novice category in rodeo is for up-and-coming rodeo competitors who have not yet reached their 21st birthday. There were just four riders in this category this year which was won by 20 year-old Blaze Cress of Cheyenne, Wyoming with a score of 69. He was followed by the pride of Goodwell, Oklahoma, Jake Finlay with a 66, Lane Cust of Ardmore, Ab, at 65 and Kole Ashbacher of Arrowwood, Ab. This novice-level event designed for young men with nerves of iron and muscles to match, finished in a tie between Buck Moen of Elrose Saskatchewan and Justice Bruno of Maskawacis, Ab. with scores of 69. Third in the four-man field was Tanner Young of Fairview with a score of 67 and Dustin Shaver of Crooked Creek who ended with a 58. Ladies racing the cloverleaf has been an essential element throughout rodeo's rich history. In this BGR event, Fort St. John native, Lisa Zachoda, was the clear with an impressive time of just 13.263 seconds to earn first place and the 2,049.20 purse. Second and third place finishes went to a pair of Longview lasses; Suzanne Depaoli in second at 13.282 seconds and Kendra Edey right behind at 13.43. Team Roping is one of the few "team sports" in rodeo and features a whole different skill set than simply staying on an enraged critter of some sort. The 2015 BGR winners in this exciting event were Roland McFadden of Vulcan and Tyrel Flewelling of Lacombe who combined for a winning time of 4.5 seconds for the $3513.25 prize. Second place at just a second behind was a tie between Montana dwellers, Dustin Bird of Cutbank along with Chase Tryan of Bozeman and Oregon ropers, Chase and Clayton Hansen. For a complete listing of all the results from the Black Gold Rodeo, visit the Rodeo Canada website.